Un beau sentier pour s’en aller aux cieux. Au plus sainct lieu du temple de Memoire. A fair path to raise himself to the heavens. In the holiest place in Memory’s temple. Simplicity, as Ronsard closes his first book of sonnets. And also a glance at the ‘real world’ around him: for this was not a time of peace and love in European politics! The Italian wars were a major feature of Henri II’s reign, all the way through the 1550s, and early victories led ultimately to the embarrassing Treaty of Cateau-Cambrésis… The Spanish on the Rhine are, incidentally, the Habsburgs – for that family controlled Austro-Germanic Europe as well as Iberian Europe. Blanchemain’s version shows considerable variation in the sestet: the opening octet was not changed. Qu’à mes chansons ton nom se vienne offrir. Qui sont là hault assis au rang des Dieux. Qu’un camp armé n’y pourroit resister. Pendue au croc ne m’ose plus rien dire ? Mainte belle Ode, et mainte Bucolique. Ou du tout rien, ou faveur bien petite. Qu’ils ne seroient sans honneur les derniers. D’assez bon œil m’attiroit à son œuvre. Apprendre l’art de bien Petrarquiser. Que pleures-tu, Cassandre, ma douce ame ? Sans achever l’ouvrage tout entier. Le trait d’Amour qui surmonte les Rois. Je chante Amour, tes beautez et mes larmes. « Ou s’alentit, ou se rompt vistement. Et plus vaillant au combat retoumoit. Leger fardeau, Charon le passe mort. Your name to put itself forward in my songs. Who are seated above in the ranks of the gods. As for an armed force to resist it. Hang from a hook and dare no longer speak ? Many a fine Ode, many a Pastoral. Either nothing at all, or very little favour. It will not be dishonourably last. Drew me with a clear eye to her work. Learn the art of Petrarch-ising well. Why do you weep, Cassandre, my sweet soul ? Without completing the whole of my work. The wound of Love which can overcome Kings. I sing of Love, your beauty, and my tears. And returned, more courageous, to battle. Charon carries his light burden, dead. The conclusion of the first book of Amours brings with it some weightier material to give it a firm feeling of ending – rather like Beethoven’s 5th, which iterates and reiterates the thumping C-major chords to emphasise that this really is the end of the piece, Ronsard feels (rightly) that he cannot simply end the long run of sonnets without something more definitely marking a conclusion. 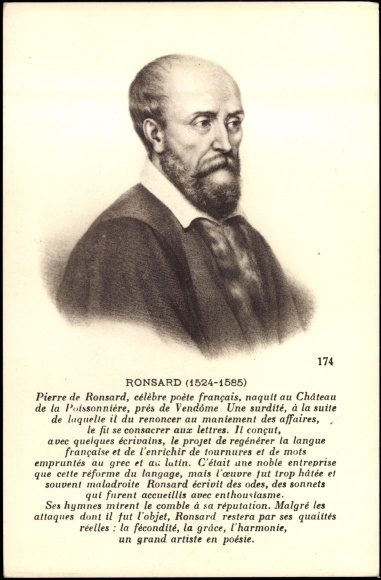 Perhaps there is, nonetheless, a sense of loss as Ronsard explains how he must stop writing love poetry to focus, by royal command, on his epic Franciad. – Charon is of course the boatman who ferries the dead across the river Styx. – towards the end, “Mon Roy n’a pas d’une tigre sauvage …” (a savage tiger’s milk rather than a savage beast’s).